I thought I’d hit “publish” on this yesterday. Sheesh. Day 06: a song that reminds you of your BFF. For my older readers, “BFF” is youthspeak for “Best Friend Forever.” While I have a few long-term friends, only one person on Earth truly qualifies for the BFF title — my only brother. He’s just a couple of years younger, so we essentially grew up together. Even though I teased him mercilessly (because he was so easy to provoke), we remained close friends and almost never fought the way some siblings do. During our frequent moves during our boyhood years, we sort of had to hold to each other as a steady constant. We even attended the same college. Adulthood has been an adjustment since, unlike me, he has never really returned home. He’s always had a healthy dose of wanderlust; I’ve resigned myself to the fact that he’ll probably always be an average of 1,000 miles away. Indeed, I know he’s happiest and most fulfilled that way and wouldn’t have it otherwise. But when he’s home, I love the familiar sight of him from behind plugging away at some project on his computer in his old bedroom. And, unlike myself, who likes to put an iTunes playlist completely on random, my brother prefers to play a select few songs daily. During one of his more recent visits, he’d listen to “1,000 Oceans” by Tori Amos ALL THE TIME. So of course, I can’t hear it without thinking of him. To echo some of the song’s lyrics: I could never, would never keep him from flying. And most of the time, I don’t cry a bit, much less a thousand oceans. But once in a while …like today(:))…I just want to sail him home. Most of my boyhood activities centered around cartoons, so it’s really a matter of picking a theme song. In the end, though, there was only one cartoon that actually literally had me running home to see it — and, later, religiously programming the VCR to tape it. This trio of completely separate Japanese cartoons rewritten into a single transgenerational epic absolutely riveted my younger brother and me. It was unlike anything we’d seen on American TV before since the much-more straightforward Starblazers from years earlier. I’m still a bit astounded at how well it all works despite the heavy editing. I’m also still saddened that Carl Macek, the man behind it, passed away last year at the far too young age of 49. I’ve owned the soundtrack for years, but the opening theme has never felt completely nostalgic without the sound effects. Thank you, YouTube. It’s been way, wayyyyyy too long since the last update to this long, lonnnnnng-running series. Time to wrap it up, already. It has also come to my attention, as I’m writing this, that Irvin Kershner, the director of The Empire Strikes Back, has passed away today at the the age of 87 [EDIT: it was Saturday, Nov. 27]. My condolences to his family and friends. I pray he is now in the arms of Our Lord Jesus Christ. Needless to say, he will be remembered and beloved by generations of Americans for his contribution to the Star Wars saga. And I can think of no better tribute than to actually finish this retrospective on his most famous work. 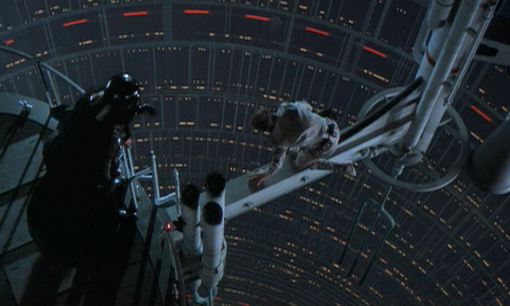 This image has stuck with me; Luke can only pathetically inch away from Darth Vader over the yawning abyss beneath. So Vader’s attempting to tempt Luke to know the POWAH of the dark side of the Force, and Luke’s having none of it. He’s good. Vader’s bad. He’s the golden-haired, blue-eyed hero, Vader’s the villain in black. For goodness’ sake, Luke is an actual whole human being (well, up until a minute ago). 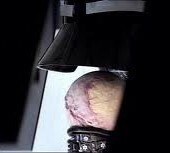 Vader’s humanity, this tantalizing glimpse notwithstanding, is definitely in question. That is, until the matter of Luke’s father comes up in the conversation. Vader: …Obi-Wan never told you what happened to your father. But Luke’s anguished denial is, like mine was, more based on emotion than on fact. And while Vader’s certainly given us reason to distrust him, even at age nine I had to consider this news could be true. When the very embodiment of evil shares a kinship with the golden heroic ideal, a powerful LIFE LESSON emerges: Nothing’s ever absolutely black & white in this world…except the truth! Here, then, Luke’s earlier vows to never join Vader or be lost to the Emperor are put to the test. He’d made those vows A) without knowing the truth and B) assuming that he couldn’t possibly lose. Now he has two excellent reasons to renounce those vows: his thought-long-dead father is alive and he will certainly die if he doesn’t join him. That Luke chooses certain death by stepping out into the bottomless abyss is a powerful reinforcement to a LIFE LESSON learned way back in Part 5: Shun evil. NO MATTER WHAT. This shot of Luke falling toward the camera is the one that stuck with me...showing that the seemingly bottomless pit apparently had no TOP, either. And just when it seems nothing could get worse, it does. Luke ends up stuck on the underside of Cloud City, barely suspended over the truly bottomless drop of the gaseous planet. The scene of the maimed Luke reduced to begging the spirit of Ben Kenobi to help him remains the very picture of hopelessness. (It also struck me as incredibly useless. What could Ben DO? …Even if he HADN’T warned Luke he couldn’t help him if the young Jedi faced Vader? An unfortunate lesson I almost gained here was: If you disobey your mentors, don’t come crying to them for help when you fail. But the truer LIFE LESSON was: If one person or method doesn’t help, try another. Sometimes it’s the unlikeliest one that saves you. After so many dark events, a bit of fun returns to the proceedings as the Falcon’s hyperdrive fails again. I wondered if we might be in store for another extended chase scene like earlier in the film. …and it’s their mutual references to each other as father and son, along with Luke’s openly wondering why Ben Kenobi had lied to him, that sealed the question for me whether Vader was telling the truth. …the LIFE LESSON that I took from it is this: Even if you’re losing just about as badly as you CAN lose, just one clean escape to fight another day is as good as a win. 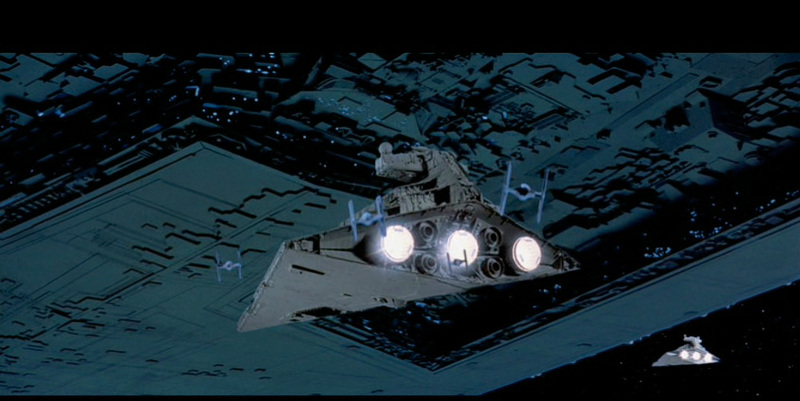 On the flipside, Darth Vader, who’s been summarily and capriciously executing subordinates for their failure to capture the Falcon under much more difficult circumstances for two hours of film time, suddenly fails to execute ANYONE for letting the tiny ship escape for good literally right under the flagship’s nose. I could speculate a half-dozen solid reasons why. But for the purposes of this series, it merely served as a mild reinforcement to the LIFE LESSON learned from Darth Vader’s dark revelation: Nothing is absolutely good or bad…and that apparently includes Darth Vader, too. That does it for the Life Lessons. But I have just a couple more thoughts and impressions from the very end of the film. Lando = NOT scruffy-looking. But I totally noticed how he was dressed like Han Solo and wondered if Han was truly being written out of the series. At this point, ANYTHING seemed possible after the events of this film. And Luke gets a new hand. I also really, REALLY didn’t want the movie to be over. John Williams’ wonderful love theme (which reminded me so much of the Gone With The Wind theme that I conflated the two for years after) truly reflected the yearning emotion that the heroes have for their lost, frozen friend and, in this viewer, the yearning for this incredible film to not be over. But, of course, I knew it was. Thus I’ve finally almost completed my look back at my all-time favorite movie. I want to compile all the Life Lessons learned into one summary as a bookend…and perhaps I’ll get to that by Christmas. Thank you for reading and for your patience. Life Lessons from The Empire Strikes Back [part 10]: prelude to The Duel. I learned a lot from this battle. Wow. I originally intended to be done with this series by late June. But here it’s September and I’m just starting the final segment, which is going to run for at least 2 installments. But enough with recrimination. On with the retrospective! The duel doesn’t start with the first clash of lightsabers captured above, but several minutes earlier in the film, when Luke decides to abandon his training at a crucial stage to rescue his endangered friends. Thus was an earlier lesson I learned in the film reinforced: Don’t abandon your friends and comrades. The first line is in response to the ghostly Obi-Wan’s voiced fear of losing Luke to the dark side the way he lost Vader, his previous apprentice. The second line is a similar vow given to Yoda regarding his unfinished training. These exchanges remind me of an episode near the end of Jesus of Nazareth’s earthy life. Two of his disciples, James and John, conspire with their mother to jockey for right- and left-hand-man status with Jesus when He comes into His Kingdom. Jesus asks them if they’re able to pay the same price in suffering that He’s about to endure. In their blindly ambitious naivety, both say they can and will. Like Luke, the “sons of thunder” had no clue what they’d just vowed to do. The LIFE LESSON of this scene, then is this: don’t make vows you really don’t know if you can keep. Wait…what? You mean Luke might not walk away from this? At age nine, I barely registered this bit of foreshadowing, but it really is a subtly masterful storytelling device and a bit of insurance on the filmmakers’ part if their lead actor is lost somehow. Yoda’s warning that Luke’s training might save him. Obi-Wan’s warning that he can’t help Luke this time. 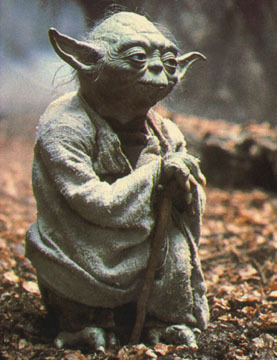 Yoda’s revelation that Luke isn’t the only hope. Vader’s demonstrated unilateral authority in the movie so far. And, most of all, the Rule of Expectations. My earlier assurance that Luke was destined to win (based on a fellow kid’s spoiler) was dashed in the scene at the cave midway through the film. I’ve never been as on-the-edge-of-my-seat in any movie experience before or since. Thus the first LIFE LESSON of my Empire Strikes Back summer was reinforced: expectations have a way of coloring and affecting everything we do or experience. But my (and Luke’s) naive expectation of Luke’s victory is, with this scene and the others represented above, put into serious doubt. Consequently, a corollary lesson emerges: the reality still trumps the expectation. Don’t get ahead of yourself, kid! Next time, we’ll look at what we can learn from the actual fight.